"Will I still be British after Scotland becomes independent?" That's a question that was no doubt asked or thought about by at least a million people during the first Scottish independence campaign in 2014 - and sadly, I feel that identity is an issue that was not really thought about by the yes campaign, and that the issue was not addressed properly. I don't know about anyone else, but my vision of an independent Scotland is one that's about self determination, and yes, pride in Scottish culture and heritage comes into that, of course it does - but my vision of an independent Scotland is one in which everyone is welcome, and one that people who identify as British not only feel welcome, but feel embraced, and are safe in the knowledge that their right to their identity is not only protected, but defended. If folk in Scotland truly want independence, they'll find a way to unite the country behind that cause. Bigotry, small mindedness, and an unwillingness to compromise will NOT unite people, it will DIVIDE us. Trying to force and unwanted identity upon someone, or choosing to openly disrespect their identity, is harmful to our cause. We need to seek it out, point it out and weed it out. It is bigotry and nothing less. Do we really want to live in an independent Scotland if is not open to all? I certainly wouldn't. We can achieve independence by leaving the door open to all who live here, especially such a massive section of society, our family members, neighbours, friends and colleagues who identify as British. Of course, many people in Scotland feel disassociated from this identity, for one reason or another. But it must be accepted that geographically speaking, Scotland will always be in the landmass known as the British Isles, and so the people in Scotland who feel or identify as British have the absolute right to do so. It saddens me that there is evidently quite a large proportion of people within the yes movement who cannot get past the fact that if they want independence, they must be willing to leave the door open for the millions or more people in this country who feel at least somewhat British. To seek to undermine someone's identity by making stupid and foolish statements such as 'British isn't a nationality' or 'Britain isn't a country' and all that nonsense - please tell me how that's going to get people to warm to your position? There's a book from the early 1900s called 'How to Win Friends and Influence People' - perhaps some people need to get themselves a copy. Why do we want independence? I think it's because we want self determination. I think it's because we want to break free of a ruling elite based around Westminster that has got so badly crooked and set in it's ways that there is no possible way of changing it for the better. I think it's because smaller government is much more accountable on a local level, both socially and financially. I think it's because our priorities will be different, and that we will live in a fairer and more open society. So is being British compatible with that desire? Yes, of course. There are of course 500,000 English born citizens living here in Scotland. There are also Scottish people who identify as both Scottish and British, and their right to do so must be protected. It is sad to see that there are some people in Scotland who have been taken in, hook, line and sinker by the divide and conquer agenda that has blighted society for centuries. People have fought wars over identity. People are willing to lay their lives on the line to protect their identity, so the idea that someone's identity will change, or that they will suddenly change their entire belief system because Scotland becomes independent is frankly ridiculous, and actually quite sad. Whether you personally feel Scottish, British, or a mixture of the two is irrelevant. The point I am making here is that if we truly wish to see Scotland finally achieve self determination, we have to be willing to compromise, as a yes movement. We must be able to absolutely destroy the argument perpetuated by mainstream media that we are anti British. Destroy that argument by saying to people that our vision of an independent Scotland will NOT seek to threaten anybody's identity. We must present a vision of a Scotland that EMBRACES our neighbours, colleagues, friends and family members who feel British. We must open the door to them, and perhaps then, we will be able to convince them of the arguments for independence. If we go into the next campaign for independence and take the issue of identity seriously, then we can address that awful stigma that was attached to the yes movement last time around. We CANNOT bury our heads in the sand. If we do, we do so at our peril. It's time to challenge anti British bigotry head on. It's time to say, if you feel British, Scottish independence will NOT threaten that identity, but that we, as a country will do all we can to protect and preserve your absolute right to identity as British, and to respect the fact that you have that right to do so. It's time to speak out against anti British bigotry whenever it rears it's ugly head. Whilst it is understandable that people may have a problem with the British Government, this is about the system, not the people and not individuals. We must be careful about the language that we use when we are talking about independence and we must leave the door open firstly to those who feel British, and secondly to those who may warm to the idea of independence but are sadly put off by this perceived anti British bigotry. There are many great arguments for independence, and one of the main arguments against it last time was that we would somehow be leaving a 'family of nations' - it's time to present the argument that by offering true devolution through independence, does not mean that we cannot continue to be a family of nations. In fact, quite the opposite is true - we can be a closer family of nations, and we can actually get on much better with full fiscal autonomy, meaning more local accountability for all. It's time to learn lessons. For many reasons, the independence campaign didn't quite convince enough people last time around. If we are to walk blindly into the next campaign without addressing the important issue of identity, I do fear that we may close the door on at least a million people who seek reassurance on this matter. David Cameron's last speech for the no campaign last time around used the issue of identity to his advantage. He called us a family of nations and insinuated that we would no longer be a family of nations after independence. It is clearly the fault of the yes campaign that we never addressed this issue, and made the case that we would be a stronger family of nations after independence, because we would have true devolution through independence and more trust in a smaller and more locally accountable government. Theresa May has often uttered the phrase "we may be leaving the EU but we're not leaving Europe" and while I may not be her biggest fan, she had a point - she was addressing the identity issue. Perhaps we should be saying to those people who feel British "we may be leaving the UK, but we're not leaving Britain. Yes, we will be an independent country, but no, your identity will absolutely not be under threat." "Will I still be British after independence" some may ask. Time for us to say, "yes, we will protect and defend your right to feel British and we do not seek to threaten that identity that is so very important to you." Time for us to address bigotry, tackle it head on and learn from one of the biggest mistakes of the last campaign - ignoring the extremely important issue of identity. If we continue to do so, we do so at our peril. Time to be the change we want to see in the world, in every sense of the word. I am a mongrel,Scottish,English,Irish and live on an island named Britain,called after one of the original Celtic people. I am not anti-English,I have no time for Westminster Government,it does not represent Scotland or it,s wishes.It is self possessed as being English.They are independent,to a certain degree so is Ireland, WHY NOT SCOTLAND? ?We have immigrants from all over,that accept they are living in Scotland,some a mixed family,by what rights does the English Government have to split families,over rule Scots Law,(Part of the Treaty of 1707,Scots Law recognised and not sub-servient to English Law!!) No point in staying in any sort of union were you are not respected,in reality no one said Scotland,s independence changed the island that we live on,but we are as free as they are! to be responsible for our own country and how it is run, including the use of all of Scotland,s resources.without interference,lying and misuse of our people and resources.The present situation does not represent Scotland,the secrecy and lack of respect tells it,like it really is.Maybe it is a lack of education the further south you go! the less they know,anything now is too little too late.!! I have absolutely no problem with someone who currently regards themselves as Scottish not British, that is their absolute right. Indeed, rather than me just having "no problem" with the attitude I actually admire the stance and it is with increasing reluctance that I admit to possessing a British Passport. I do have a problem though with YES communicators and YES strategists who promote the, IMO, very unhelpful advertising slogan, "Scottish not British". I have been trying to point out the counter-productiveness of it for about 5 or 6 years now in our efforts to persuade any "soft" NO voters to turn to YES. I do not understand the difficulty that I am having in persuading the likes of Peter A Bell and others. It could be a generational thing that people younger than my 75+ years might not get because of different growing and life experiences. 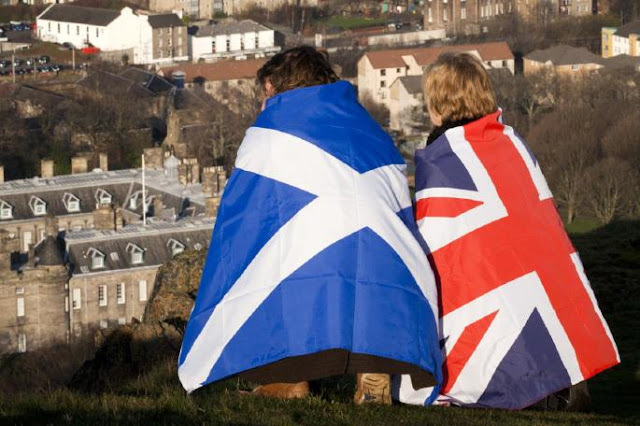 For many former, recent and existing Unionists the pull of Britishness might be very strong, and to continue to challenge that link will prove not only increasingly difficult but also, surely, a completely unnecessary use of YES energy. We former Unionists ( even a former Devo-Max supporter, is after all, a former Unionist) might have fond memories of service by father in the British Army or other defence forces in WW2 and by similar service of grandfathers in WW1 and involvement in earlier British Army conflicts. Additionally we have fond childhood memories of organisations like British Road Services, British Railways, British Gas, British Waterways, British Overseas Airways Corporation, British European Airways, British Standards Institution. British Steel, etc and other organisations that might not have survived Tory privatisations of the eighties. Stamp collections were amongst the objects that reminded us all that half the world had connection with "British" and our education was often organised to take our part in that global endeavour. Britishness is not the enemy though, if indeed there is an enemy at all. UKishness is much closer to being so. It is certainly a much softer target than Britishness...one phonetic equivalent of UK is, after all, "uck". It is certainly much more important to the causes of Scottish, Welsh and English Independence, that the UK concept is recognised for the fantasy that it is. Scots' problem is with the Westminster Establishment and with the organisation known as the United Kingdom. It is these 2 institutions that it is logical to focus opposition on. Any other opposition is distraction from the main YES effort. Let us keep our focus on the main goal and leave Brits and wannabe Brits to enjoy their Britishness in peace.